If your kids are anything like mine, they love cookies! 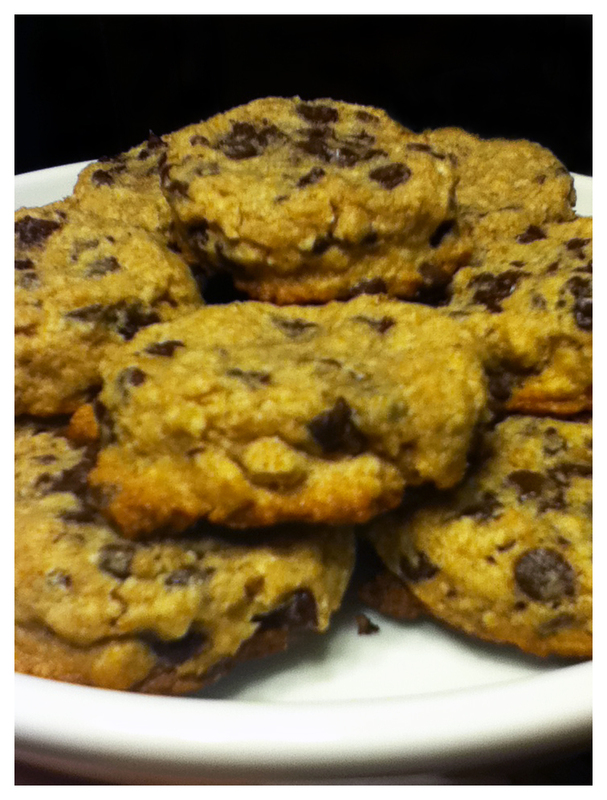 Heck, who am I kidding…I LOVE cookies, however my waistline doesn’t share this love with me. The other day I tried my hand at this recipe and must have messed up somewhere, so I decided to give it another go tonight. I don’t remember where I found this recipe, but I did tweak it just a little to add some moisture to the dough by adding some applesauce. You can also substitute applesauce for the oil if you want to make them even healthier and more waist-line friendly. *If your dough seems a little dry, add 1/4 cup unsweetened applesauce before adding the chips like I mentioned I did above. Grind oats in a blender or food processor. Transfer to a medium bowl and stir in flour, baking soda and salt. Beat butter in a large bowl with an electric mixer until fluffy. Add oil, granulated sugar, brown sugar, egg and vanilla; beat until smooth and creamy. With the mixer running, add the dry ingredients, beating on low-speed until just combined. Stir in chocolate chips. I hope you enjoy these as much as my family did. My kids LOVE cookies and it’s nice to know I have a whole-grain, lower sugar recipe that I can now bake for them, in place of the store-bought ones. I’m so glad the appleauce worked!! I may have to give this recipe a try. We do love cookies!